Kyle M. Owsley, B.S., D.C.
Dr. Kyle Owsley grew up just an hour North of Bowling Green, Kentucky in Cecilia. He attended the University of Louisville on a Presidential Scholarship and accepted the Dr. Frank Sartz Recruitment Scholarship from Palmer College of Chiropractic in Davenport, Iowa. 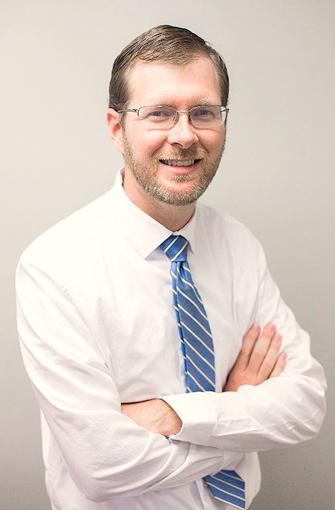 At Palmer, Dr. Owsley was selected to be a teaching assistant in the technique department where he helped other students learn about adjusting the vertebrae in the neck during cervical technique courses. He also participated in the Palmer Clinic Abroad program where he had the pleasure of going to Morocco to provide chiropractic care for people who lived at the foot of the Atlas Mountains. He also strived to learn more about the Gonstead Technique. Dr. Owsley participated in the Gonstead Club and the Troxell Program and took extra classes in and out of school to learn more about Gonstead Chiropractic care. After graduating from Palmer College of Chiropractic in 2004, Dr. Owsley came back to Bowling Green, Kentucky, and has loved it ever since. The Owsley family has grown to four in the time he has been in Bowling Green. His wife Jessica is a local pharmacist, and they have two children together; Lela and Aaron. You will catch the Owsley family doing a few different things around the Bowling Green area, particularly fishing at Barren River and walking as many outdoor trails as they can find. Dr. Owsley knew from the time he was 6 years old that he wanted to be a chiropractor; a driver accidentally hit the gas instead of the brakes while in a parking lot and pinned his mother between 2 cars. Dr. Owsley's mom suffered a severe back injury that led to months of rehab and many consultations with surgeons. Not liking the options that were given to her, Dr. Owsley's mother decided to schedule an appointment with a chiropractor. Within two weeks of treatment, the tingling and pain down her legs were gone. She also had decided to have her two sons evaluated for potential spinal problems. Dr. Owsley also had another reason for his interest in the field. As a child, he suffered from chronic nosebleeds. After seeing a chiropractor, they were no longer an issue.